August 10, 2018 Dan O.
Ron Stallworth (John David Washington) is a young, up-and-comings black detective in Colorado Springs, Colorado who is doing whatever the hell he can to make his mark in the force. After a few unsuccessful attempts, he has a crazy, yet impressive thought: infiltrates the local chapter of the Ku Klux Klan. But being a black man, just how the hell can he do that? Well, by handling much of his business by phone, Stallworth sends out fellow officer Detective Flip Zimmerman (Adam Driver) to get acquainted with the local chapter, know of what they’re plans are for the future, meet the head of the KKK, David Duke (Topher Grace), and most importantly, become the leader of the chapter. It’s a mission that’s so insane, that it just might work, but it also proves problems for the department, as well as Zimmerman himself, who is also Jewish, when a few of the KKK members don’t know whether or not they can trust just what this new member is all about. Looking good, Den, I mean, uh, John David. Spike Lee will forever and always be one of my favorite directors, but it’s a very testy relationship. The past decade or so has seen Lee jumping literally all over the place, from material that’s so messy, it’s hard to understand (Chiraq), to material that’s a tad too dull (Da Sweet Blood of Jesus), and to other material that while interesting, still feels like something of a cop-out (Oldboy). He’s never made a boring movie, or even an uninteresting one, but as is usually the case with Lee, there’s a whole lot to be said, but not a whole lot of thought behind the words, so we get movies that should be better and much more powerful, than they actually are. BlacKkKlansman is the rare case in which Lee takes it down a whole lot, figures his voice out, and oh yeah, delivers a powerful, compelling, and altogether interesting movie. Does that make it perfect? Nope and more often than not, you can sometimes tell when Lee loses himself, but mostly, BlacKkKlansman stays on a steady-path, giving us a too-good-to-be-true-story, with enough tension, excitement, social-talk, and believe it or not, hilarity to keep it moving and always watchable. Even the small moments that don’t always work, there’s at least five or six scenes that follow, that do and remind us why Lee is one of the best of all-time. But like I said, BlacKkKlansman is a sure sign of Lee having something to say (as he usually does with every movie), but also not forgetting about other important things like story, and character, and most especially, a reason for ranting and raving. 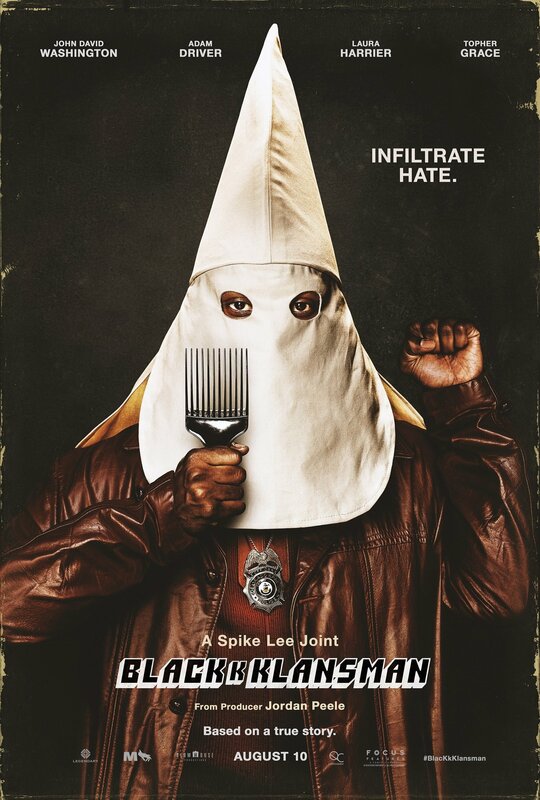 BlacKkKlansman takes on racism in a way that’s obvious, but with it being almost a year since the events of Charlottesville, there’s an undying need for an extra hammer to the head, to not just help us remind us about this crap that’s currently going on, but remind us where it all stems from. And even though Lee is, as usual, very angry here, he knows how to keep it all calm and laid-back to where we get to see these sometimes jarring acts of racism and bigotry, in surprisingly humane ways. Even the KKK members themselves, while hateful animals, still seem like human beings who are probably the people you’d see at the grocery-store, or on the street, and not think a single thing of, but wouldn’t you know it? They’re huge, undercover racists who want to put “America First” and “Fight for White Rights”. That’s why the casting of Topher Grace as David Duke is so pitch perfect, because he gets the opportunity to be fun and charming, yet below it all, is this boiling pit of hateful racism. I hate you, yet, want to talk to you? How does that happen?!? Oh, and did I mention that BlacKkKlansman is funny? Like, really funny? Which is weird, because there are plenty of bits and pieces that are dark, scary, sad, and dramatic, yet over it all, Lee always keeps a darkly comedic-edge to it all, where even he realizes how ridiculous and crazy these proceedings can get. But that’s why his movies can usually work; no matter how mean or nasty he can get, he never forgets to have a laugh about it, either, whether intentional or not. A lot of the jokes are made at the expense at the racist a-holes and just the lengths their racism goes to, but it’s also at the expense at those who are still trying to come to terms with how these kinds of people out there really do exist and need to be stopped. Once again, it’s a conversation that Lee wants to have and he most definitely does here, but he also never forgets to keep things entertaining and fun. Cause even though it’s always great to watch John David Washington and Adam Driver act like the weirdest odd-couple in buddy-comedy history, there’s also something compelling about the two of them sitting in a room, discussing race-relations and how it can, even with all of the hate and evil in the world, get better. Even the final-segment from Lee, which shows all of the racism we have in today’s society, remains a powerful testament to what he’s able to say as a story-teller, even when he’s hitting the nail on the head a million-times in a row. It’s why he is one of the best. Ever. Consensus: Exciting, entertaining, well-acted, thoughtful, and surprisingly hilarious, BlacKkKlansman stands as one of Lee’s most accessible pieces, but still remembers to wave its angry finger around, too. Come on, guys. Hug it out. Great review Dan! I haven’t seen many Spike Lee movies so when I first saw the trailer for this one I felt so confused, but watching it again I got a better feel for it. I can’t wait to see it now when it comes out in the UK later this month!